Southern California - home of fast cars, beautiful girls, sun-drenched beaches and ten guitar players on every block. Even in this musical madhouse, the cream has always risen to the top. Never has this been more evident than in this release by Steve Samuels. Born without a left hand, his arm ended just below the elbow. Nevertheless, he utilized it like a one-fingered wrist and picked a right hander's guitar by holding it upside down and backwards. Steve is completely dedicated to his art and employs taste and style. He has worked with Muddy Waters, Otis Spann, Roy Brown, George Smith and William Clarke. 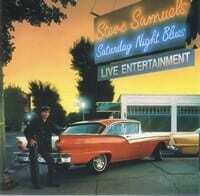 Steve Samuels has been inducted into Sac Blues Hall of Fame. Steve Samuels passed away 2014.